Test yourself on the concepts discussed in the video above using the self-grading quiz questions below. When revising, which of the following questions should you ask? Choose all that apply. a. Do my paragraphs have topic sentences? b. Are the commas all in the right places? c. Are all words spelled correctly? d. Do my main points relate to my thesis statement? e. Does my essay contain a thesis statement? When editing, which of the following questions should you ask? Choose all that apply. We want to give you examples of students' writing processes so you can see what they look like. Read the situation; then, read each example and answer the questions that follow it. 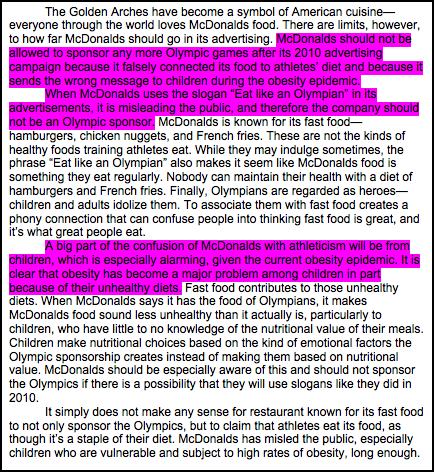 Dr. Downey asked his class to write about the following topic: McDonalds has been an Olympic sponsor for many years, including the 2010 Winter Games in Canada. 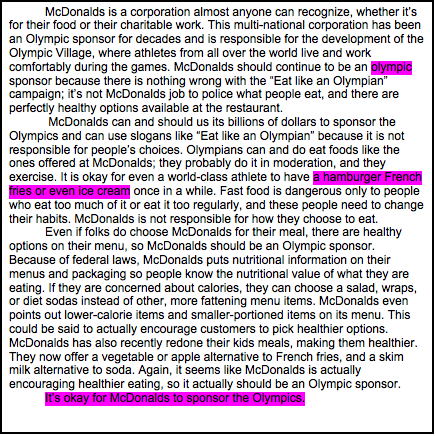 The theme of that year's campaign was “Eat like an Olympian.” This theme was criticized for sending the wrong message to children about the nutritional value of McDonalds' food, especially since Olympic athletes typically follow strict diets (no hamburgers and fries) when they are training. A nation-wide student group is considering a letter-writing campaign asking McDonalds to step down as an Olympic sponsor. Do you think McDonalds should step down? If Petra is in the revision stage, why has she probably highlighted her thesis statement and topic sentences? a. Because she wants to make sure that her topic sentences support her thesis statement. b. Because she wants to make sure the commas are in the right places. c. Because there are grammar issues in each of those sentences. d. Because the language in those sentences is unclear. No. If she is revising, she is editing for content in her essay and is probably checking to make sure that her topic sentences support her thesis sentence. Do Petra's topic sentences support her thesis statement? Why? a. No. The thesis statement discusses another main idea. b. Yes. The topic sentences contain new big ideas that are kind of related to her main idea. c. Yes. Her topic sentences contain ideas that support her main idea in her thesis sentence. Pierre has mostly highlighted grammar issues in his essay. Pierre should add the following to at least one of his sentences. Pierre might make which of the following edits to his last paragraph. a. Add to it because it is too short. b. Delete it because no conclusion is necessary. c. Add some fancier punctuation to it. 0 out of 0 correct.